Ultimate Exotics reptile breeding facility is a state of the art reptile breeding facility where we breed reptiles for wholesale to pet stores, private sales and export. As industry leaders we are passionate about our reptiles and their care, well-being and hygiene is very important to us and is the back bone of our success. Through over 20 years of captive breeding reptiles we have established a collection of high quality reptiles that we are proud of. At Ultimate Exotics we pride ourselves on the health of our reptiles and in doing this one of the most important things is what we feed them. This is why we have a large facility where we breed all the feeder foods for our reptiles, ensuring that we are feeding our reptiles the best quality food. This includes mealworms, super worms crickets, roaches and rodents. We also breed excess stock which we package in shop friendly packaging for wholesale to pet shops all over South Africa and to sell direct to the public. If there are any feeder foods you need please contact us for a price list. Ultimate Exotics Wholesale Reptile Products, Reptiles and Feeder Foods. At Ultimate Exotics we also specialise in wholesaling reptiles, feeder foods and reptile related products to pet shops around South Africa. 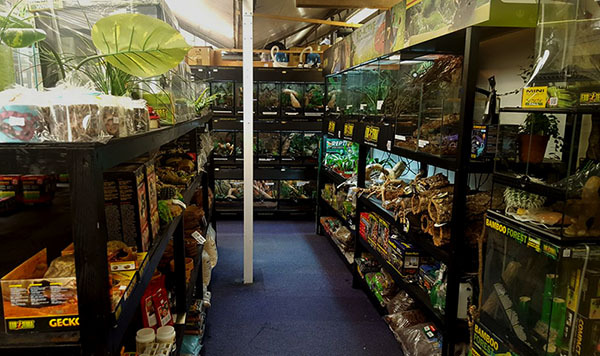 We are a one-stop wholesaler for pet stores looking to stock everything they need that is reptile related. From the quality captive bred reptiles bred by us, feeder foods and the largest range of quality reptile products that are sourced locally and imported. Please contact us for a wholesale price list. 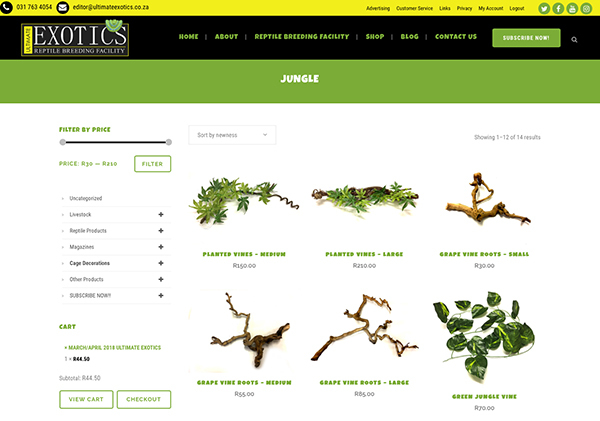 The Ultimate Exotics online shop was created in order to help customers that do not have access to a local pet shop in their area that stocks reptile products. Our online shop allows customers to get all the essential things they need to care for their reptiles and exotic pets correctly where ever they live in the country. It is safe, secure and convenient and we ship nation wide! Ultimate Exotics also publishes South Africa’s only reptile and exotic pet magazine, which has been in publication since 2007. We consider this magazine to be your, the reader’s, magazine. Our goal is to gather and share valuable, expert, first-hand husbandry and breeding information for snakes, lizards, amphibians, arachnids, and other local and exotic animals. In this way we can ensure the growth and success of the hobby we share, as well as enabling you to achieve good results and the best experience with your animals. Ultimate Exotics is now a digital magazine which is distributed widely throughout the whole of South Africa and the rest of the world and serves to encourage responsible exotic pet keeping in South Africa and promote, teach, and introduce people to our hobby/industry as a whole. Articles in Ultimate Exotics are written by experienced keepers and breeders who share their valuable experience, allowing readers the opportunity to have the same successful results with their animals. Ultimate Exotics is a vital source of information for all exotic pet enthusiasts in South Africa and the rest of the world. Don’t miss out! 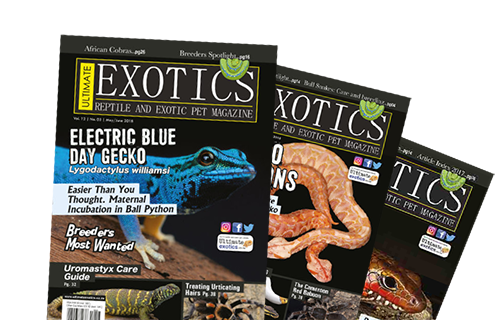 Subscribe now to the FREE digital Ultimate Exotics Reptile Magazine, and you can have all the benefits this magazine offers emailed directly to you! So don’t delay – information is vital to success, and the more you know the better off your animals will be!